Microwave absorbers Our range consist of high performance, broad band, carbon loaded polystyrene absorbers with an operating frequency of 70MHz up to 40GHz. MT-series microwave absorbers feature excellent performance at microwave frequencies, which makes them perfect for antenna pattern measurement applications and compact antenna test ranges (CATR). Are you in need of a microwave absorber for your testing facility? Comtest does refurbishments (chamber upgrades) and supplies individual microwave absorbers for a wide range of applications. Call +31 71 541 75 31 or use our online contact form if you want to know more about the possibilities. Polystyrene absorbers have always been far more durable and stable than their polyurethane foam counterparts. In terms of performance however, foam used to be the better option, that is until now. After two years of development, Comtest has finished development of its new polystyrene microwave absorber: the MT45-JT, a javelin-tipped, high performance absorber that offers performance as well as durability. We have long been staunch advocates of polystyrene absorbers. After all, they offer many advantages over their polyurethane foam counterparts. They have superior rigidity and tensile strength, they are compliant with all necessary fire-retardant standards without the use of hazardous materials and they are highly resilient to changes in ambient humidity and temperature. This results in an extremely durable product that comes with a 25-year warranty and is expected to last well beyond that. Our closed cell polystyrene absorbers don’t contain poisonous fire-retardant chemicals. They are therefore sustainable, environmentally friendly and fully compliant with REACH and RoHS directives. They are also suitable for clean room class 2 as per ISO14644-1 and class 1 as per US Federal Standard 209E. 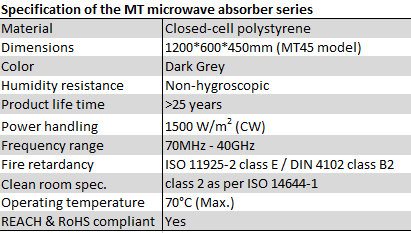 Our MT-series consists of 5 types, where the MT50 model is not suitable for traditional microwave testing applications, but designed for non-hybrid MIL-STD applications up to 18GHz. Absorber performance graphs can by found in the corresponding brochures. The MT25 absorber is also suited for sVSWR floor setup configurations according for CISPR 16-1-4 testing in semi anechoic chambers used for EMC testing. The MT25 consist of a single baseplate and 128 tapers. The absorber dimensions are 1200*600*250mm (h). To protect the absorber tips whilst stacking the MT25 can be equipped with two grey end caps (model ECT-25-G). 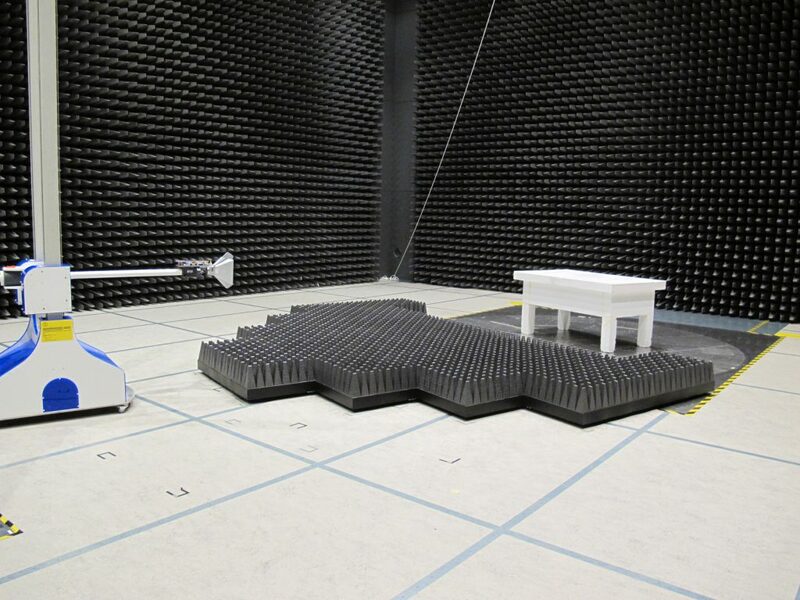 The Comtest walkway solution is designed to provide safe and easy access for the test engineers to the antenna and EUT in full anechoic chambers. Due to the use of connectable fiberglass reinforced epoxy grid panels, they combine extreme strength with minimal RF scattering. It is recommended to use the walkway in the non-critical area of the chamber and at a reduced height compared to the applied floor absorber. More information on walkway solutions, including specifications and pictures, please check our digital microwave absorber brochure.